The perfect fuel card to help your business grow. If you’re looking for a fleet fuel card with no transaction fees, look no further. We help fleets save on transaction fees. Our fleet fuel card customers experience the best customer service in the industry, 24/7/365. Our fleet fuel card online tools give you oversight and control of your account. Multi Service Fuel Card has been helping carriers grow since 1978. We work hard to be your trusted fleet fuel card partner and understand that you have a choice when it comes to fueling. Regardless of how big your fleet is, we want to help your business grow. In 1978, a former fleet owner believed there had to be a better way for a driver to pay for fuel than a pocket fuel of cash and oil cards. From that belief came Multi Service Fuel Card, which not only gave fleet owners cash price at the pump, but account oversight and control like never experienced before. 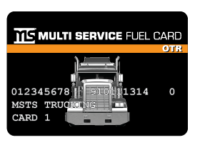 Today Multi Service Fuel Card is accepted at more than 4,900 locations and has been a trusted partner for fleets across the United States and Canada. Ready to run with the Powerful Card? Get Started Today!